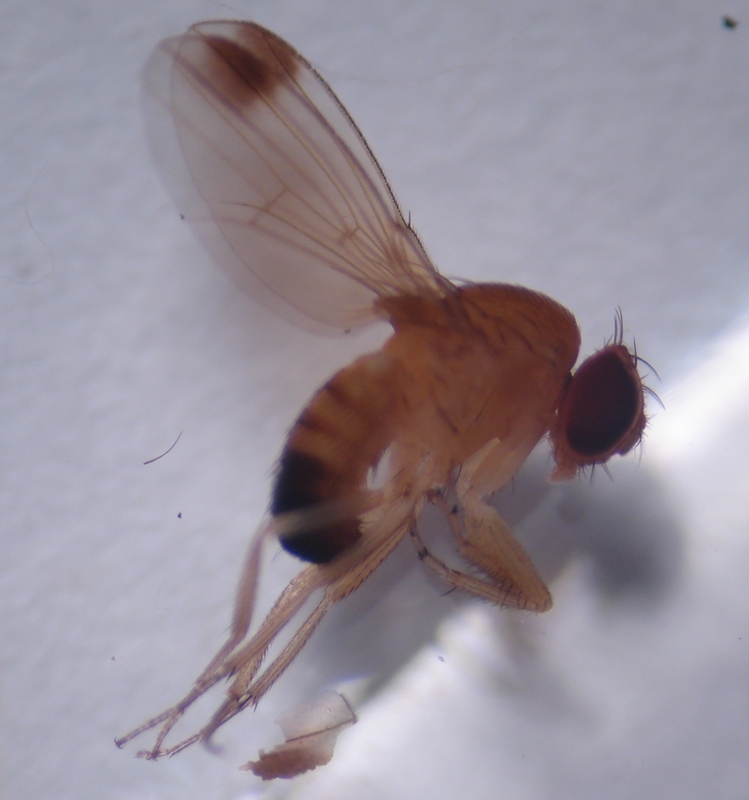 Female spotted wing drosophila (Drosophila suzukii). The wings of the female do not have spots. © Michael Durham. Used with permission. Only the adult male fly has the spots on its wings. Fly size 2 to 3 mm long. 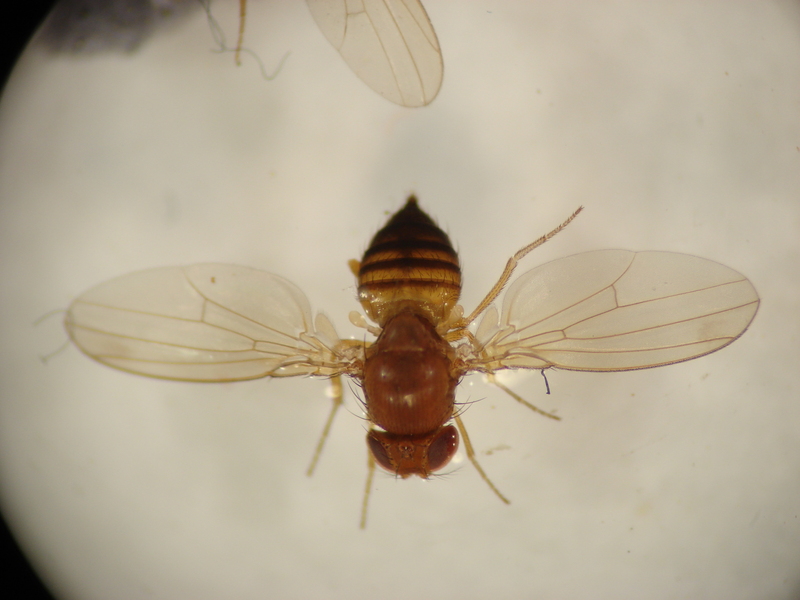 The adult female can be distinguished from native Drosophila based on the dark-colored tip of the abdomen. 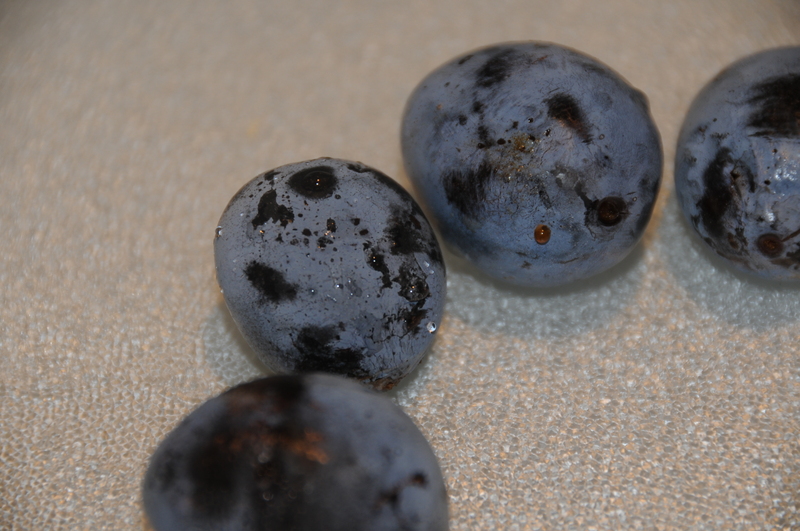 Plums damaged by spotted wing drosophila during oviposition. Note the droplet of fluid on the surface of the plum in the center of this image. 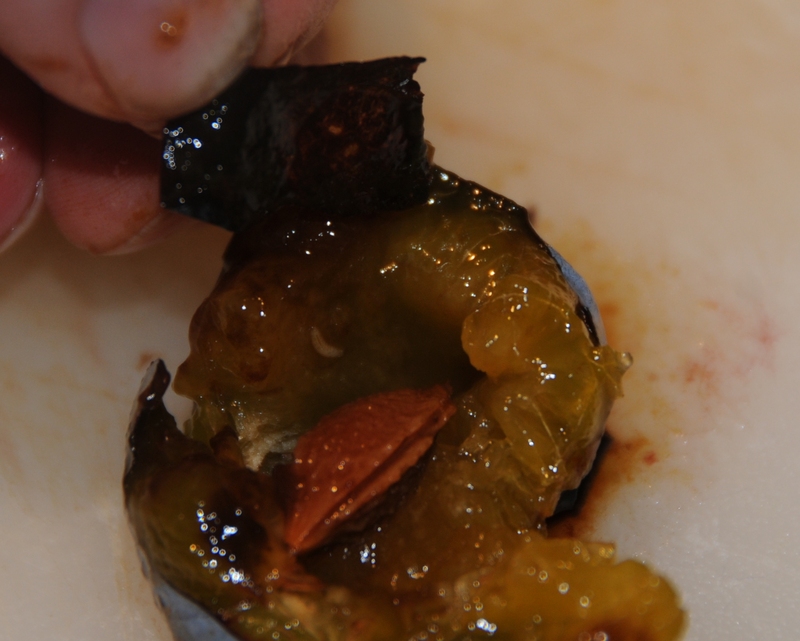 An infested plum broken open to show the maggot. Trapping for spotted wing drosophila; a homemade trap with apple vinegar as the bait. 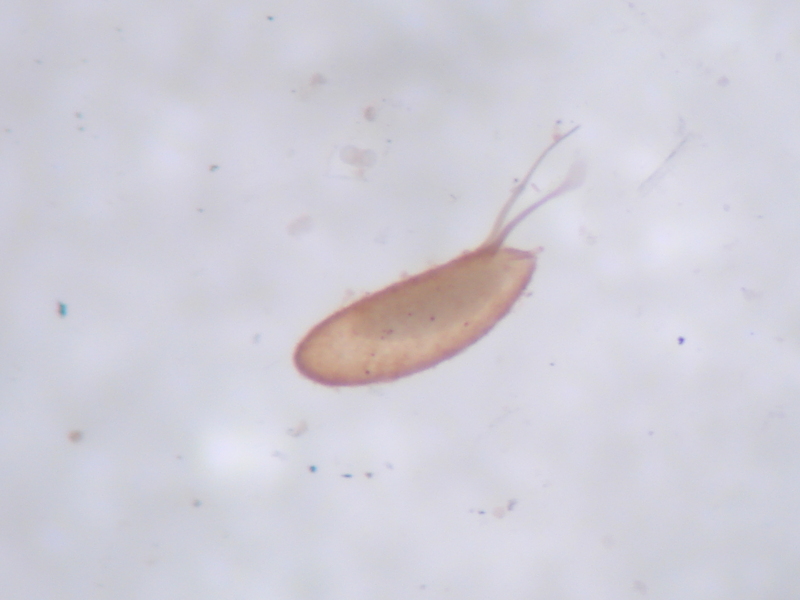 Adult spotted wing drosophila are floating on the surface of the fluid. Add a drop of soap to the fluid so flies sink. Spotted-wing drosophila (SWD; Drosophila suzukii; Family: Drosophilidae) is a key pest that targets a wide variety of susceptible fruits including tree stone fruits (e.g., cherries) and berries (e.g., strawberries, blueberries, raspberries and blackberries). SWD is widespread throughout all the important production regions in the U.S., Europe and South America. SWD originates from Asia. Pest description, fruit damage, and life cycle Adult SWD flies resemble common vinegar (pomace) flies and sometimes are referred to as small fruit flies. Common vinegar flies can be found in the kitchen, around compost piles or on fallen, decaying and rotting fruit in the garden. Vinegar flies are attracted to the smell of yeast, wine, or fermenting fruit. In the garden, most vinegar flies prefer rotting fruit that has fallen from the plant. Unlike common vinegar flies, SWD prefer ripe-to-overripe fruit hanging on the plant. It can also be found on a range of non-crop hosts in surrounding vegetation, which make control more difficult. Identification At 0.125 inch (2-3 mm) in length, SWD flies can be confused with common vinegar flies, if not carefully examined. Because SWD and vinegar flies are closely related, identification can be difficult. Both have red eyes and a yellowish-brown amber colored body. 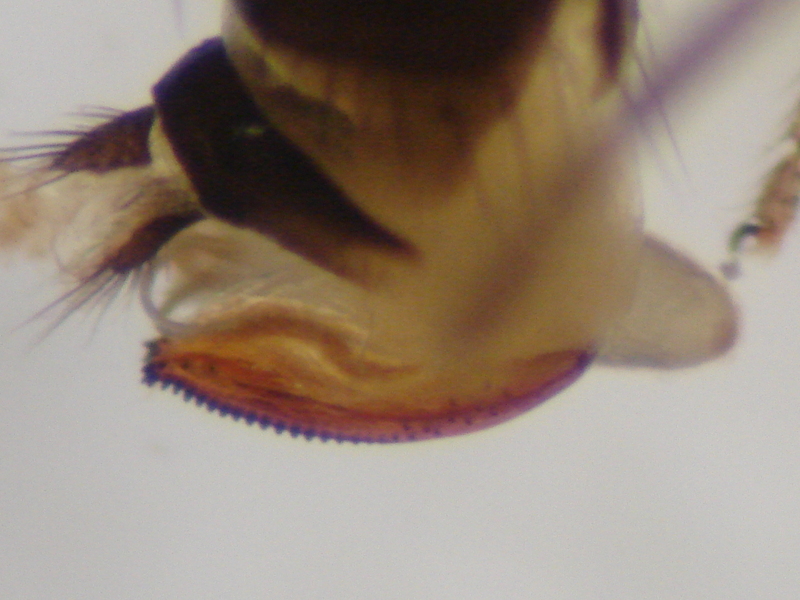 Two key characteristics distinguish SWD from other common vinegar flies: 1) a black spot (sometimes dark, sometimes faded) near the leading top edge of adult male wings (females do not have wing spots), 2) the prominent saw-like ovipositor (used to insert eggs into fruit) on the female’s posterior end, and 3) the pupae of both sexes have two respiratory horns sticking out of the anterior end; each horn with a complete whorl of 6-8 fingers/points. Several dark, continuous bands are visible around the abdomen of both the male and female. A hand lens and good lighting are useful for seeing these characteristics. Note: if the female gets caught in a liquid bait (e.g., apple cider vinegar or yeast) within a monitoring trap, her ovipositor may extrude from the body (because of the liquid), thus aiding in the identification of female SWD. See references below. Symptoms from damage To recognize SWD damage on suspect fruit, look very closely for scarring or spotting on fruit surface; liquid exuding (when squeezed) out of scar/hole where eggs were laid; softening, collapsing and/or bruising of fruit at damage site; small white larvae and pupae that can be seen with naked eye if fruit is opened; and, under a microscope, two hair-like filaments sticking out of fruit where they are connected to a white egg within the fruit can sometimes be seen. See OSU Extension Bulletin EM 9021, Recognize Fruit Damage From Spotted Wing Drosophila (https://catalog.extension.oregonstate.edu/em9021). Life cycle A single female can lay several hundred eggs in her lifetime (each adult lives for an average of 3 to 4 weeks over the summer months). Larvae feed inside the fruit for about 5 to 7 days, until they are ready to pupate. The brownish-yellow pupa with star-like (6 to 8 points) respiratory horns at one end is a non-feeding stage lasting 4 to 5 days. Pupae can exit fruit and fall to the ground or remain inside fruit. Emerging adult flies will mate, producing additional offspring. At this time, Oregon State research reports that SWD overwinter as adults. Food, moisture, and humidity are extremely important for winter SWD survival. Dryness, wind, hot or freezing weather may reduce survival, however they easily find warm refuges for protection. It has been estimated that 3 to 7 generations might occur in Oregon, depending on environmental conditions during the cropping season. Estimations of seasonal activity and SWD events for commercial crops (e.g., first and peak egg-laying in spring) can be found at OSU-IPPC Online Phenology and Degree-Day Model website at http://uspest.org/cgi-bin/ddmodel.us?mdt=all&spp=swd. Select 1) weather station on map, 2) model category: invasive insects; 3) Model parameter: Spotted Wing Drosophila [fruit]; 4) Choose Output in Fahrenheit or Celsius; 5) Select Start and End time; 6) Choose CALC/RUN full model for output. Note: the lower and upper development thresholds for D. suzukii are 10° and 30°C, respectively, with a January 1 biofix. Higher numbers of SWD are captured by red traps which have an increased fly entry area on the trap side (mesh screen or many small holes), large bait surface area, and small headspace (space between the bait surface and the exit holes). To construct a simple homemade trap use any plastic container (18 to 32 ounce size) with a removable lid. Drill small holes (0.188 inch to limit the ability of larger insects to enter) around the middle of the cup to allow SWD to enter. Leave an undrilled space on side to more easily change the bait solution without spillage. 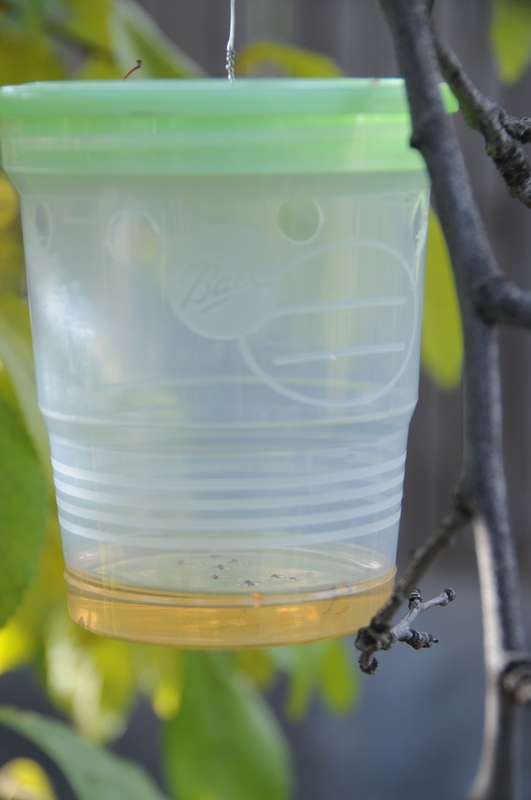 Add a liquid bait such as apple cider vinegar to the cup so that the liquid bait is two inches from the bottom. Add a drop of liquid soap to the vinegar to break the surface tension of the liquid so that flies sink more easily. An alternative bait that catches even more flies can be made from a mixture of yeast, sugar and water (2 teaspoons of dry baker’s yeast, 4 teaspoons of sugar, and 1.5 cups of warm water). Effective commercially available traps (e.g., Scentry and Tréce) are available. Attach a wire or string to hang the trap from a plant or stake within the shaded side and at the fruiting level in the plant canopy. Select trap locations where flies are likely to be intercepted (e.g., field or garden edge within the shaded portion of the canopy; near adjacent non-crop plants; near fence borders shared with other fruit growers). For strawberries, secure a trap on the ground within the plants. It is recommended that traps be strategically placed on borders of susceptible fruiting plants, before the fruit starts to ripen and darken in color. More traps increase the likelihood of intercepting SWD, thus a minimum of three traps should be placed to increase chances of SWD detection. Check and refresh traps once a week. To see SWD in a trap, hold trap in the light and look for flies with a dark spot on the male’s wings. It is difficult to confirm SWD and see the female’s ovipositor without a microscope in a cloudy yeast bait. For a closer look, filter contents from your traps using a strainer into a pan with a solid white background. Spread the flies out (using a small paintbrush or tweezers), and examine contents with a magnifying lens or under a microscope. Numerous species of Drosophila and other insects will also be attracted to these traps, especially if the yeast bait is used. Damage thresholds have not yet been established for this pest. Several methods have shown positive results for recovering larvae by using a salt or sugar solution over crushed fruit. Collect ripening fruits in a plastic bag which are suspected to be infested with SWD. See “A quick, 7-step guide for detecting larvae in fruit” (OSU Extension Bulletin, EM 9097) and “A detailed guide for testing fruit for the presence of Spotted Wing Drosophila (SWD) larvae” (OSU Extension Bulletin, EM 9096). Preparation of extraction solution: Dissolve 1 cup plain salt in 1 gallon warm water (10 BRIX); –or– 2.5 cups of brown sugar in 1 gallon water (16 BRIX). Solutions must be thoroughly dissolved to help larvae float on top of solution for easy viewing. Prepare solution in advance, if possible. Extraction method: Place a layer of crushed fruit in a shallow white pan. Pour solution (salt or sugar) over crushed fruit. A good proportion of larvae will exit the fruit after a few minutes, looking for air at the top of the liquid. A majority will float to surface, unless stuck in or under pulp. Wait for at least 15 minutes to get a majority out of fruit. Look for moving white larvae on the surface of liquid. Eventually, however, they will die and sink to the bottom of the pan. The sugar solute will keep them alive longer than salt. Do not mistake SWD larvae for plant parts, fruitworms, thrips, aphid skins, other Drosophila larvae, etc. Fruit dunk bag method: Place suspect fruit in a large sealable plastic bag. Crush fruit by using a rolling pin over bag or squeeze/crush fruit with hands through bag. Add solution to the bag of crushed fruit. Shake bag lightly to promote penetration of solution into fruit. If fruits are infested, white SWD larvae will float to the top, and fruit should settle on the bottom (note: some fruit floats, depending on fruit weight/amount and sugar levels in fruit). It may take over 15 minutes or so for larvae to float and fruit to separate. If larvae are small, a hand lens or scope and good lighting are useful to see their presence. Hold clear bag in light and small larvae may be seen moving and floating among fruit. Harvest in a timely manner—Pick fruit at regular intervals to prevent egg-laying opportunities and SWD infestations. Avoid leaving overripe fruit on plant. Clean up infested fruit—To avoid SWD populations from increasing, clean up overripe hanging, fallen and SWD-infested fruit. Several sanitation methods include using clear plastic to seal or bag fruit for at least a week. Create a barrier—If a monitoring program detects SWD, cover fruiting clusters (e.g., blueberries) or entire fruiting plants (e.g., caneberries) with a fine netting (less than 1 mm in size if feasible) to reduce egg-laying. Protect fruit from damage—Protect fruit from rain and sun to reduce fruit split, improve fruit quality, and extend the harvest season. SWD can be attracted to damaged fruit. Selection of early season and thick-skinned cultivars of fruits may reduce egg-laying. Non-crop hosts from areas surrounding your fruiting crop may be an issue—Potential perimeter, wildland and backyard uncultivated plants used by SWD may include berries from: dogwood, elderberry, Himalaya blackberry, laurel, sweet box (Sarcococca spp. ), flowering cherry, honeysuckle, and dozens of other fruiting species. 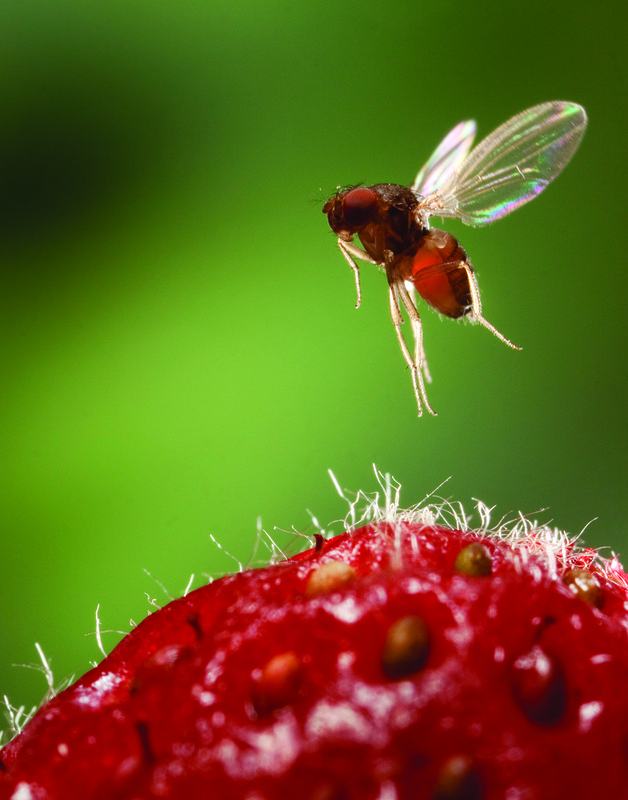 See OSU Extension publication EM9096: Noncrop Host Plants of Spotted Wing Drosophila in North America (https://catalog.extension.oregonstate.edu/em9096). Some of these fruits may not be affected by SWD under certain environmental conditions or because of specific management practices being used. Canopy and irrigation management— SWD prefer shady and humid habitats. Maintain an open and aerated plant canopy that is less attractive to SWD adults and minimize leaky irrigation lines and overhead irrigation. This link highlights effective cultural techniques to manage SWD: http://www.canr.msu.edu/ipm/uploads/files/SWD/SWDOrganicBerryCrops.PDF. Cooling fruit—Chill fruit (less than 34°F) immediately after harvest for extended time periods (greater than 4-8 days), but retaining fruit quality to slow or kill eggs and young larvae. Research is underway to determine the specific predators and parasitoids (wasps) that attack SWD larvae and pupae. Field observations suggest that ants, spiders, predaceous bugs (e.g., minute pirate bugs, big-eyed bugs), yellow jackets, lacewing larvae and parasitoid wasps may be important biological control agents. Chemical controls should be coupled with monitoring efforts. Rotate chemical families to avoid resistance and follow the label for each crop. See specific fruit for recommended chemicals. Pesticide families that help control SWD include: spinosyns, pyrethroids, carbamates, and organophosphates. These chemicals kill SWD adults, and some may have an effect on larvae that are developing within and are protected by the fruit. Follow the label for appropriate rates and risks. Do not apply when bees and other pollinators are present, such as when plants are flowering or when pollinators are active. Spotted Wing Drosophila (http://spottedwing.org). This site contains links to additional information.